CNC router tables have a flat, machined surface with grooves or channels over the whole area and rubber seals. Metallurgical advancement in router bits have allowed for higher speed machining, creating a substantial force on the parts on the table, therefore requiring a tremendous hold-down vacuum force on these parts. Vacuum provides the means to create those forces. With a pod system, the vacuum pump can see air directly from the wood that is being held down. With a nested parts router, the vacuum system will pull a vacuum on the underside of the composite panel, but as cutting and drilling occur, sawdust can be pulled into the vacuum system. 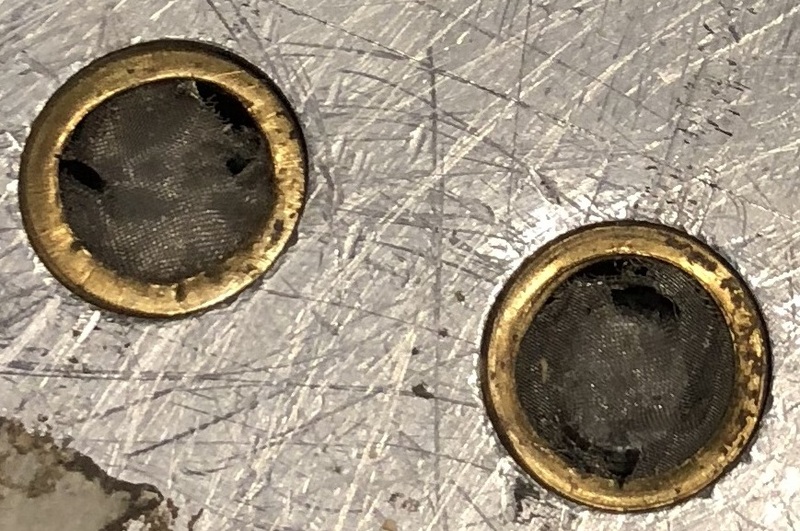 While an oil sealed vacuum system can excel here, in that it can pass small amounts of sawdust without damaging the vacuum pump, heat exchanger fouling can become an issue. Other vacuum pump technology types (lubricated rotary screw and dry rotary vane) are totally dependent upon the inlet filter functioning properly as any sawdust ingestion will break the pump. It is therefore critical to use efficient inlet filtration and proper maintenance with regular cleaning. Lack of maintenance will cause increased carryover of wood dust into the vacuum pump and possible rupture of the filter element. It will also increase the pressure loss over the filter resulting in a reduction of the pump capacity and vacuum level. As an example: At a vacuum level of 24” Hg the pump capacity loss is 33% at a pressure drop of 2” Hg and 50% at 3” Hg. Because of the heavy dust load the pressure drop can increase rapidly. It is therefore highly recommended to install a two-stage inlet filtration system whereby the first stage utilizes a cyclonic separation filter to separate the large particles, followed by an efficient 10-micron filter. Proper care should be taken when cleaning an inlet filter. Make sure that the inlet filter doesn’t get ruptured by knocking it against a wall or garbage can. Care should also be taken if using compressed air to clean the filters because the filter may be ruptured by the force of the air. Determining how much vacuum is needed to hold down parts on your CNC router is a very important step when selecting a vacuum pump. Several other variables enter the equation, which also need to be considered. 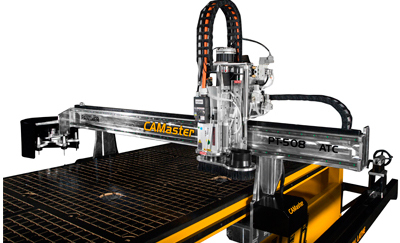 CNC router users typically use one or more vacuum pumps to create vacuum to hold down workpieces on the router table. This applies to materials such as wood, plastics, aluminum and other non-magnetic materials. A significant advantage of vacuum chucking is that workpieces can be held on the router table with great force while preventing damage or distortion to the parts and also eliminating the need for fixtures. 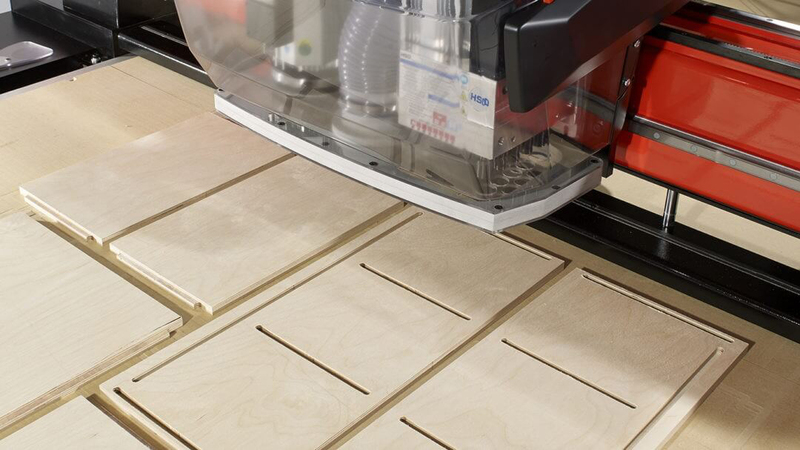 Vacuum chucking can be achieved by using individual rubber pots such as the Carter Pod system, which are the preferred choice for smaller parts, or by installing MDF board on the router table and drawing a vacuum through the board to pull down the parts to be machined on the MDF board. The purpose of this article is to explain the relationship between vacuum level and hold-down force. For industrial vacuum pumps the degree of vacuum is expressed in inches Hg (mercury). The barometric pressure at sea level is 30 inches Hg or 14.7 lbs/in2 (PSI). By creating a vacuum in the channels of the router table under the MDF board we create a differential pressure by utilizing the barometric pressure to apply force on the workpiece on top of the MDF board. The degree of vacuum we can achieve depends on the quality of the seal between the router table and the MDF board, the leakage rate through the MDF board and the size of the workpiece in relation to the size of the router table. The smaller the workpiece the more leakage through the MDF board and thus the larger the required vacuum pump capacity to achieve the required vacuum level. In addition, the leakage rate will increase as more parts are routed and more of the MDF board is exposed. The hold-down force required depends on the type and quality of the router tools and the force generated by the depth of cut and feeding speed. As a rule of thumb, the average hold-down force on a single piece should be around 2000 lbs. 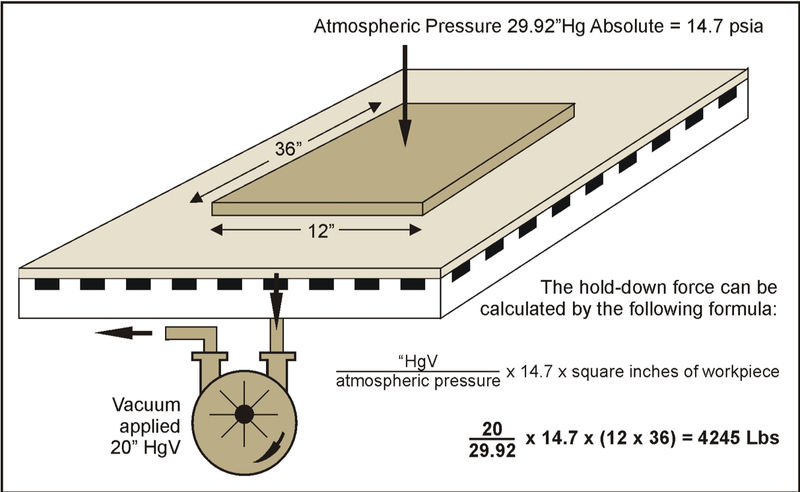 Generally, a vacuum level between 18 – 24” Hg is sufficient to create the required hold-down force. To calculate the hold-down force we can use the following formula: For ease of calculation we use a rough ratio of 2 : 1 to convert inches Hg to lbs/in2, i.e. 1 PSI equals 2” Hg. Total hold-down force = Vacuum Level (“Hg) x size of the workpiece in square inches. Altitude has an effect on the hold-down force and must be taken into consideration especially on smaller parts. The following example shows the relationship: Assume the total air leakage to be 100 SCFM at a vacuum level of 20”Hg at sea level, barometric pressure is 30” Hg. P1 = 30” Hg, V1 = 100 SCFM, P2 =(30 – 20) = 10” Hg absolute. P1 = 25” Hg, V1 = 100 CFM, P2 = (25 – 20) = 5” Hg absolute and V2 = (25 x 100 )/ 5 = 500 ACFM at an equivalent sea level vacuum of 25” Hg. As mentioned before, a vacuum level of 18 – 24” Hg is generally sufficient to create the required hold-down force since at 18” Hg the hold-down force is 9 PSI and at 24” Hg the equivalent force is 12 PSI. To increase the vacuum level to 26” Hg will give us only 1 PSI more force but will increase the required vacuum pump capacity by a minimum of 50% because of the increased pressure volume ratio as explained above. It also explains the importance of minimizing leaks and make sure to clean the table on a regular basis to reduce leaks. Source: Jan Dekker is the founder of Dekker Vacuum Technologies Inc. For information call 888-925-5444 or visit DekkerVacuum.com.